Level 1. No previous trekking experience is necessary, but you need to be an active hillwalker. You should consider training prior to your trek, as typically you will be walking between 4–6 hours per day over several consecutive days and usually at high altitude. Be prepared for rough and rocky trails and the occasional snow patch. Level 2. 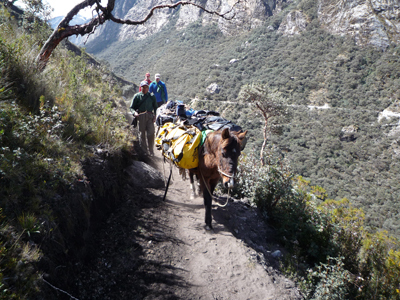 Challenging | These adventures involve trekking in remote areas for up to 8-10 hours a day, possibly more. With remoteness comes potential to encounter variable weather conditions. Be prepared to carry a full pack weighing up to 20kgs and be completely comfortable in adverse weather conditions and remote locations where evacuation may be very difficult. Level 3. Entry level mountaineering / Exploratory Treks | They involve either extreme trekking and basic mountaineering. Expect remote and poorly defined trails in variable weather conditions for up to 12 hours a day (possibly more subject to weather conditions and altitude). This may include a number of demanding high pass crossings and evacuation may be difficult from remote areas. Prior experience trekking at altitude is preferable but not essential and you should be comfortable in adverse weather conditions. Prior technical mountaineering experience is not necessary. Terrain will involve low angle snow slopes. Ropes may be used during treks for glacier travel and steeper sections of ice and snow.